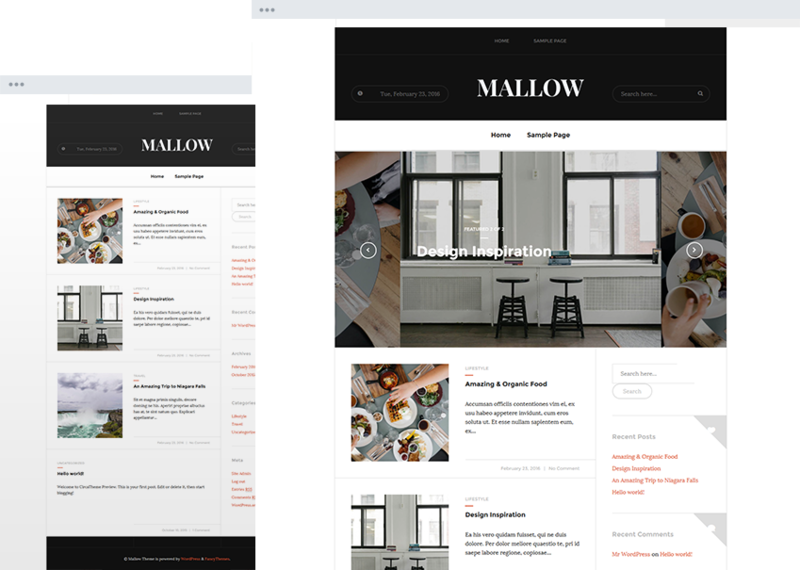 A classy and flexible theme, Mallow is well-balanced for writers of all kinds. Use this blank canvas to express what’s on your mind. Using the Live Theme Customizer click and change all elements, from header to footer, to match your brand. Establish your brand further by sharing your custom logo. Keep it simple, add text, or include a favicon. The choice is yours. Use the intuitive color picker to change background, link, text, sidebar, header, and footer colors. Carefully coded with search engine optimization (SEO) best practices in mind so your site can be easily found. Images will appear beautiful and crisp on all devices, even the tiniest mobile ones. User experience is at the forefront with fast loading speeds and no excess code. All of what you need, nothing that you don’t. All major browsers (FireFox, Safari, Chrome, and Internet Explorer) will render your site as you intend. Guaranteed to keep up with the latest WordPress version. No sacrifices here. Make a statement using a large background image. Give your site a minimalist feel or mimic a portfolio for more content exposure. Create stunning sliders to showcase your latest content. Includes 1 year of support and 1-click updates.